I’ve been shooting the brand new Olympus OM-D E-M5 Mark II since Friday and it’s been interesting. It’s kind of neat to use a camera before it’s available in stores, thanks to Brett from Olympus, for the opportunity. This Mark II version brings a couple of big improvements and a host of small tweaks. One notable feature is the new high-resolution mode that generates 40MP JPEGs and 64MP RAW files. It uses the newest sensor shift technology to make 8 1/2 pixel passes, and combines them in camera to generate high-resolution images. This is strictly a tripod only feature, you can’t hand-hold the camera in this mode. But done right, it’s quite amazing. 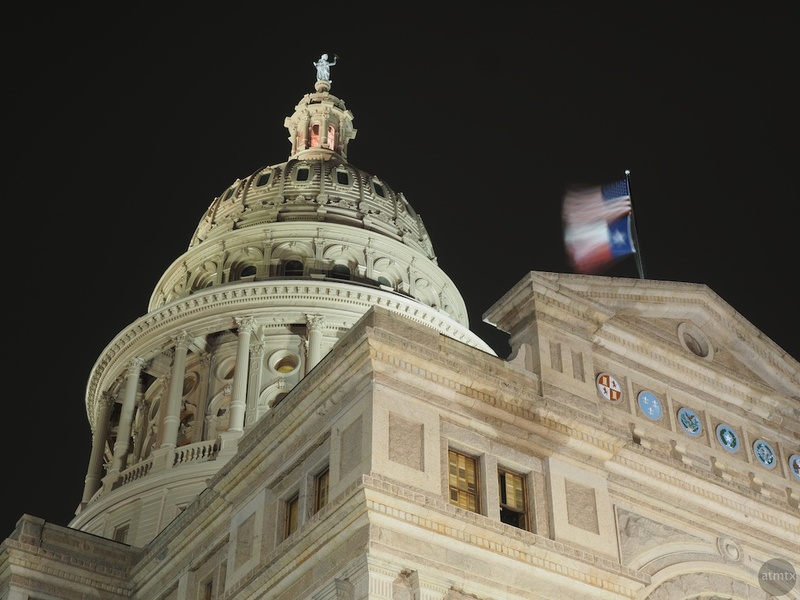 Charles and I went down to the Texas State Capitol on Friday to do some testing. Both Charles, who works for Olympus, and I were sporting identical E-M5 Mark IIs with the 12-40mm f2.8 Pro lens. The building was a good subject since it has loads of detail and doesn’t tend to move much in this seismically stable part of the U.S.
Because the camera effectively makes multiple passes to create the image, it doesn’t work well for subjects that move a lot. The camera needs to remain stationary and so does the subject, for the most part. But, it’s not as limiting as I thought, especially for someone like me that frequently uses a tripod. As you may know, I often shoot urban landscapes at night. The high-res mode works like a long exposure. You see motion blur but it may work out OK, depending on the situation. More on this below. 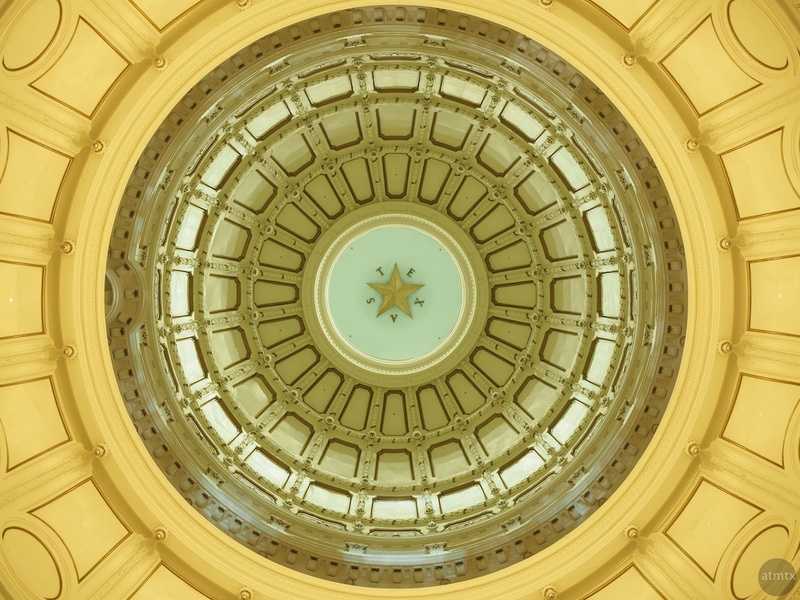 Look at this example of the State Capitol. 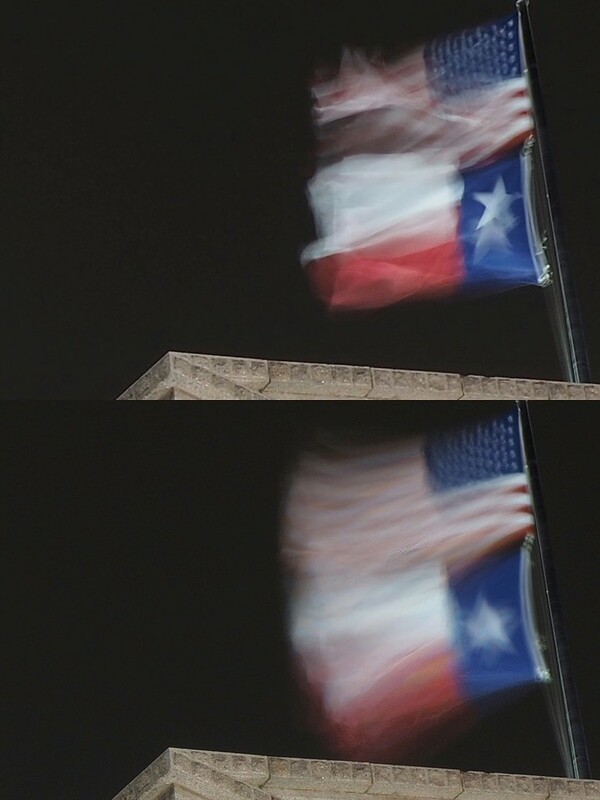 The flags are blurred because the high-res mode has combined multiple 1 – 2 second exposures together on that windy night. The net effect is similar to a single long exposure, with of course an immense amount of detail. Also, because the camera is taking multiple pictures, the exposure times for each photo get added together. I read somewhere that the “time penalty” for the high-res mode is about a second, but that’s true only if you have sub-second shutter speeds. Since I shot at ISO 200 at f8, the whole process took a lot longer. Let’s look closer at the results. Viewed full size on my 27” monitor or on my 15” retina monitor, the regular and the high-res images look identical. We need to zoom in or print them super large to really see the difference. There are two ways to look at the output. First, let’s look at both versions at 100%. Notice that the high-res mode is larger because it shoots at 7296×5472 pixels instead of the standard 4608×3456. 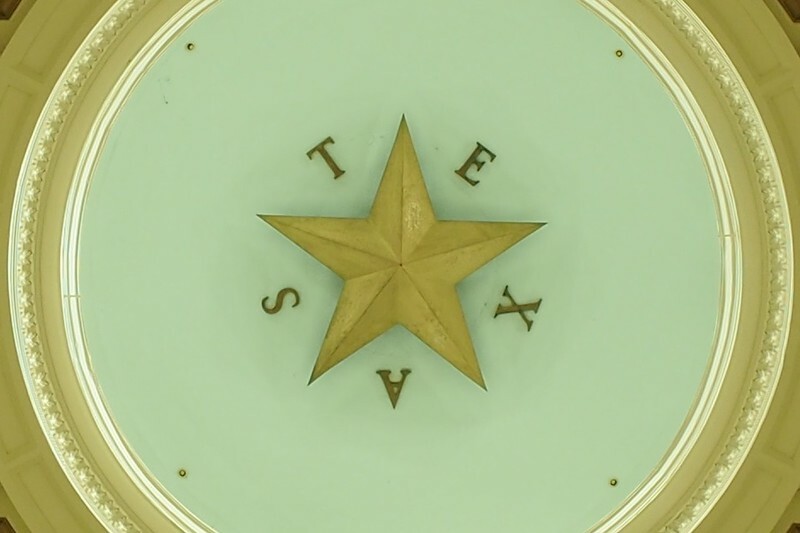 What you’re looking at is the ceiling of the Texas State Capitol’s dome. It’s a 950×633 pixel crop from the center of the frame. Reference the first photo at the top of the post for the full image. 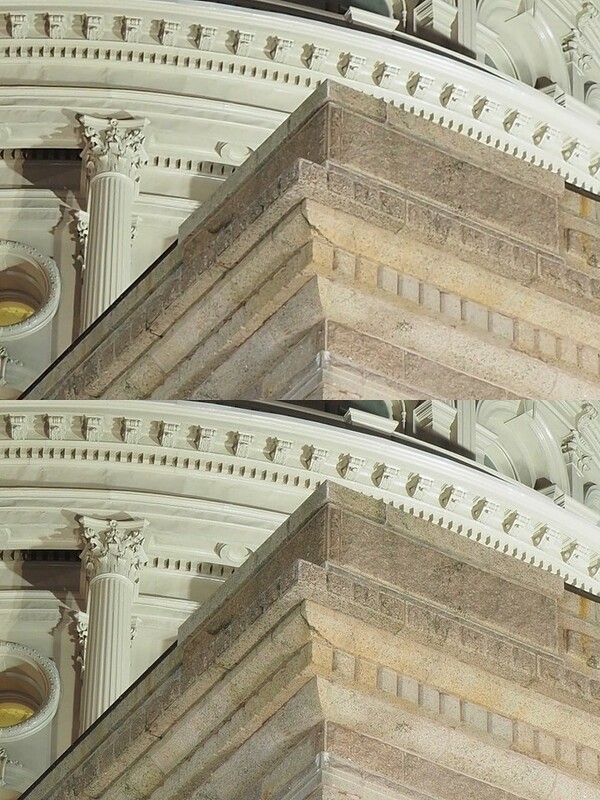 The other way is to set the output of both photographs to the same resolution and compare the details. That’s what I did here. I took the high-res version and shrunk it to the same resolution as the standard-res (both at 4608×3456 pixels). What you’re looking at is a side by side comparison of the shrunken high-res version and the standard version. 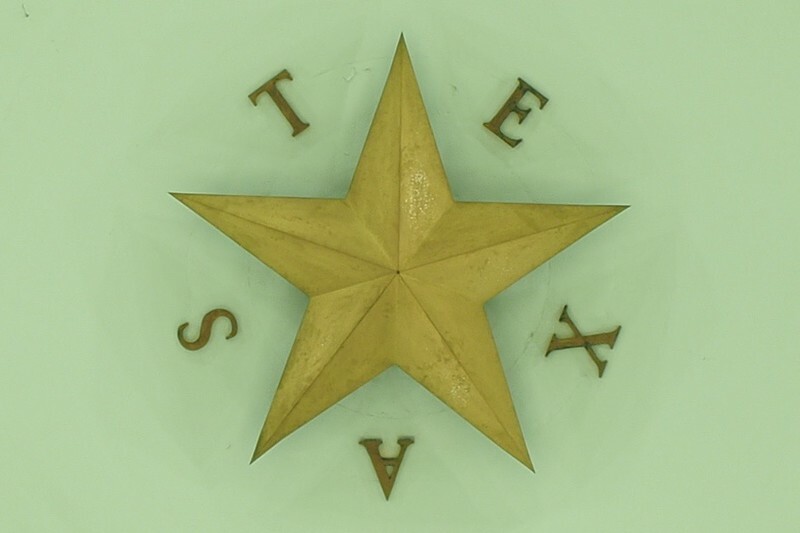 Both are at 100% crops from the center portion of the photograph above (again at 950×633 pixels). I’m sure you can tell which one was originally the high-res version. Here’s one more comparison. Same methodology. This time, I’m at 100% on the waving flags. The standard exposure was 1.6 seconds long. The high-res version is more blurred since it combined multiple 1.6 second exposures. If you look closely, you might notice a fine mesh like pattern on the waving flags. I suspect the pixel shifting and the subsequent merging process created these artifacts. These don’t look too bad, but look at the next image. The mesh like pattern is a lot more visible at 100% on the high-resolution version. 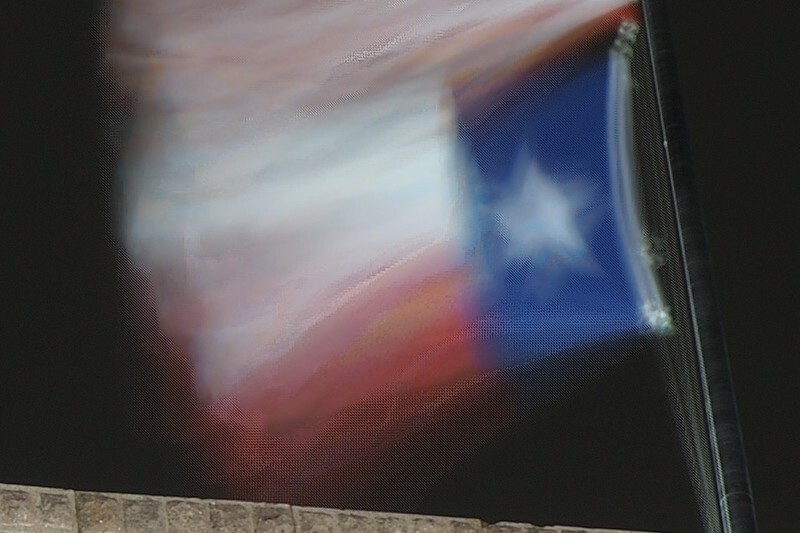 This is an extreme example since there was quite a bit of flag movement and I was shooting with a slow shutter speed. The photo may still work, depending on how large you plan to output the image. But the more movement you have, the more mesh like artifacts you’ll probably see. So shooting on tripod doesn’t ensure perfect shots — much depends on the subject. Even still landscapes might have a certain level of movement due to wind, for example. So is the high-res mode worth it? I think so, especially for someone like me who is willing to use a tripod. There’s a lot more testing I want to do. How does it work in extremely low light? How does it work for HDRs? During the day with a fast shutter, this high-res mode should work much better, I imagine. I’ll do more tests and report on them, so check back. I want the EM5 mkII! After using the EM5 original for more than a year, I am lusting after the flip out screen, supposedly faster focusing / better response time, and of course the 40mp mode. The EM5 is great, but a little sluggish sometimes, and the 40mp mode seems pretty amazing. Cool that you got to try it out! Thanks for the preview. Thanks Peter. I’ll give me impressions as I play with the camera. Can the swing-out LCD screen flip totally around and fit into place on the camera back? I ask that because I’ve read several squawks online from people who’ve never handled the camera but seem to hate screens that swing out like a wing. The screen on my old Panasonic can swing out, swivel in any direction, and return to its nest facing outward if desired. It’s hard to imagine Olympus not incorporating the same flexibility. The pixel-shift high res feature looks interesting, but the problems of camera motion and subject motion suggest it may be of limited value. Nice gee-whizz marketing ploy, though. I think the high-res mode can be very useful but to a limited subset of photographers. Architectural photographers for exteriors and particular interiors will be fantastic, for example. I think it can work for landscape photography too, but I’ll have to test that. The detail is remarkable, Andy!